Managing events can be one of the most stressful and challenging jobs — especially when fundraising is involved. You can easily end up juggling a dozen different systems, all with different learning curves, pricing structures, and data sets. Consolidating all of that can be a nightmare! CommitChange simplifies everything by providing all the even features you need on a single platform; which ensures that you won’t have to wrestle with data, spend hours training people, or worry about systems failing. It doesn’t matter if you’re running a small workshop or a massive fundraising gala, our event management tools will make your life a whole lot easier. iACT is a Los Angeles-based international organization providing humanitarian action to aid, empower, and extend hope to those affected by mass atrocities, creating a world where people are connected and equipped to act. 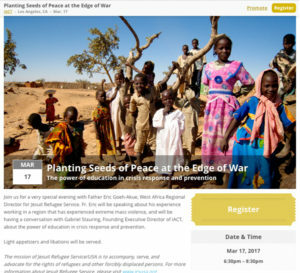 They used CommitChange’s event management features to organize a successful educational event with Father Eric Goeh-Akue, West Africa Regional Director for Jesuit Refugee Service to build awareness about the challenges faced by survivors of mass violence. iACT is one of the most innovative and fastest growing international movements working to end atrocities and heal the wounds of those who have experienced them.